You do? May I ask why? The shoulders of men and women are weak shoulders. Have you ever thought about what sin does to a person? These people are not giants. At their best, they are completely flawed. They’re unable and unfit, and they aren’t meant to carry your weight. And you’re telling me you stand on their shoulders? “Ah, but there is grace,” you say. Yes, and grace has made them usable in spite of their weakness. If I named my spiritual heroes, “giants” on whose shoulders I’m apparently supposed to stand, I could name more than a handful without hesitation. Joni Eareckson Tada. Corrie ten Boom. Elisabeth Elliot. Darlene Diebler Rose. Jim Elliot. John Piper. Chip Stam. The list could go on and on. The lives of these men and women display a deep union with their God of which I could only dream. They experienced things I never will and have been used by God in a way that is so profound that, more often than not, I read their stories and their writings with a silent awe, jaw dropped and tears running free. Yes, this makes me want to stand on their shoulders. Why do I choose not to? Because they would be horrified if I did. They would undoubtedly agree that they are only sinners saved by the unusual, indescribable grace of a God who would see fit not only to redeem them, but to also work in them mightily and use them powerfully. Then what do we see in them? We see nothing more than a relentless desire to know God and to allow that overwhelming craving to seep into everything about their lives. Joining countless others, I share their broken story and the rare yearning they’ve been so graciously gifted. And so, we are the same. Human and graced. Nobody need stand on anybody’s shoulders. If we tried, we’d often fall or end up in a place we never intended to go, because we would be at the mercy of human guides with limited knowledge and less-than-perfect motives. 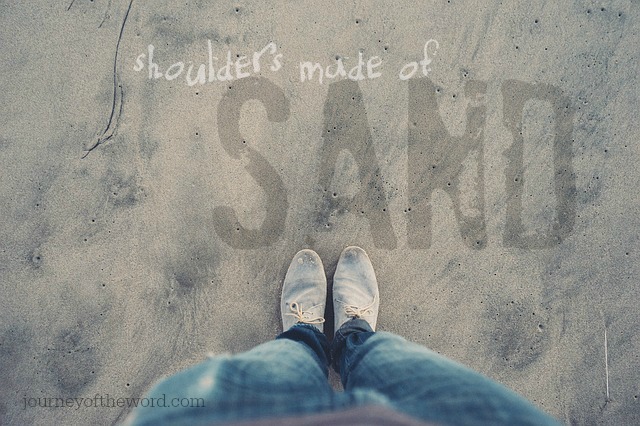 All around is sinking sand. Rather, we are beyond blessed to walk hand-in-hand, journeying through this place we mistakenly call “home.” And together, as brothers and sisters, we walk in love, being led by the only reliable Guide who knows all things and who has his glory and ours in mind. On Christ, the solid Rock, we stand. Resting on his shoulders, may we find our confidence. Beautiful, Lydia. We know the verse: I can do all things through Christ who strengthens me. I like to think of it in that, I can do all things “only” through Christ who strengthens me. Without Jesus we fall. We cannot stand on our own feet. Those that we look up to knew or know that. They could only do what they did because of the saving Grace of Jesus Christ. They could only do it because God chose to use them to accomplish His purpose. What a wonder to think that Christ takes us and uses us if we look to Him. broken sinners, Jesus loved us. He is the one we stand on. Yes, we pick up where they left off in the work. We build on the foundation already laid. We water where they planted and all that good stuff, but indeed, they were fallible human beings as we are and not to be exalted or depended upon above God or His Word. They did wrong things and they sometimes taught wrong things, but they at least tried. We can look up to them, but our ultimate example and the arm upon which we depend is the unfailing arm of the sinless, all powerful, all knowing, all present, eternal God the Father. The eternal God is thy refuge, and underneath are the everlasting arms: and he shall thrust out the enemy from before thee; and shall say, Destroy them. So well said! It’s easy (and sometimes seems safer) to put our faith in people, but it doesn’t produce a healthy Christian walk. Thanks for sharing this! Your words reminded me of Jesus’ words: “Take my yoke upon you and learn from me, for I am gentle and humble in heart, and you will find rest for your souls. For my yoke is easy and my burden is light.” Us on Jesus’ shoulders, he on our shoulders is the best place to be. Many people have left a godly legacy, and we have benefited from it. We should thank God for that and pass on what we have learned to others. We are linked to those people through the legacy they have left, but our stability and our Rock on which we stand must always be the LORD. Great reminder that we need no shoulders but only the hand of God to strengthen us. I like the connection that this makes me think of to building the house on the rock as opposed to sand – thanks for joining us again at #FridayFrivolity this week! Yes! Thanks so much for sharing. Glad this post was an encouragement to you today.